Brooke Comai and her family started Climax Jerky in 1998 through a roadside stand at 11,000 ft atop Fremont Pass in the Colorado Rockies. Bicyclists, motorcyclists, and other oxygen-starved passers by would stop to try the free samples. Since then the business has seemingly done very well. All of their jerky is manufactured by other companies, and they also resell other small hard-to-find brands to round out their the line of meat snack offerings. 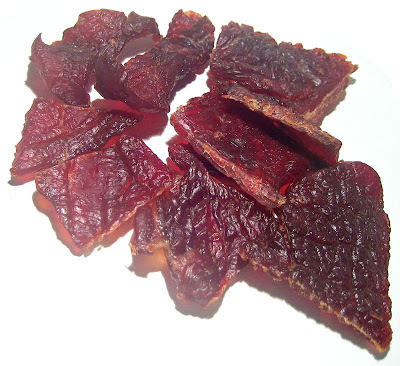 They even got recognition by Men's Journal magazine, naming their Smoked Elk jerky as the best jerky in the country. Today they still sell jerky high up in the Rockies, but also in other popular tourist destinations around the area, and through their own website. Brooke says that this teriyaki jerky is one of her top sellers. Beef, water, sugar, soy sauce, pineapple powder, apple cider vinegar, salt, flavorings, paprika, smoke flavoring, citric acid. The tastes I pick up from the surface is a fair amount of sweet, along with some smokiness, and a bit of meat flavors. Moving into the chewing, I pick up some salt taste, a teriyaki flavor, and some soy sauce taste. There is a teriyaki taste to this that I find pleasing. It's probably in a moderate amount. I don't really find the ginger taste, or any other ingredient that mimics the pungent characteristic found in actual teriyaki sauce. But if I just eat this like a snack, without thinking too much about what I'm chewing, I do get a sense that I'm getting a decent amount of teriyaki flavor. The natural meat flavors are largely absent in this. I did get that sense of meat flavor from the surface of these pieces, but in the chewing I just don't find anything that announces itself as the beef flavor. 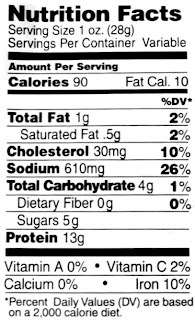 The level of saltiness tastes rather moderate and low key, despite the fairly high 610mg of sodium listed in the nutrition label. I'd say the dominant flavor of this jerky is the teriyaki flavor, with a light salty taste coming in second. After that, there isn't much more to taste. These appear to be slices of whole meat, sliced average thickness, and in small pieces. 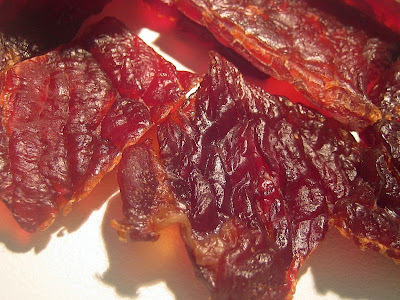 It's largely a dry jerky, with a slight bit of moisture, but still somewhat soft and tender. For the most part, it's easy to tear apart, and easy to chew. The chewing texture is very steak-like. It's a very clean jerky, leaving no residue on my fingers, and I found no stickiness at all. It's also rather lean, with all but one piece having no amounts of fat. There was one piece that had a small amount, however. But I didn't find any tendon or gristle. Climax Jerky sells this teriyaki variety from its website at a price of $8.00 for 4 ounces. That works out to a price of $2.00 per ounce, putting this on the border between expensive and average. For general purpose snacking, it's got a decent value. If you can buy this at cheaper price, it's get a better value. It does offers a pleasant teriyaki flavor, and its relative ease in tearing and chewing doesn't distract your attention. Even the chewing texture steak-like enough to provide that meat-snacking pleasure. As a teriyaky variety, it's also a decent value. It does provide enough teriyaki flavor to give you teriyaki fanatics some satisfaction, though I'm looking for something more along the lines of real teriyaki sauce. This teriyaki variety from Climax Jerky makes for a great snack. For the teriyaki jerky snacker, this will provide your taste buds with some good teryaki flavor and your mouth a good meat chewing texture. But a great snack is about all I can say about it. I didn't really find anything that stood out as being above average, at least not enough to warrant a higher rating. I don't really pick up any natural meat flavors in this jerky, and with that being the case, this will need an exceptional combination of flavorings to get it up to a higher rating. While I did find a good teriyaki taste, I just didn't find anything remarkable. For my beer recommendation, I'd suggest an Irish Red.